The border between Ethiopia and Eritrea reopened on Tuesday. 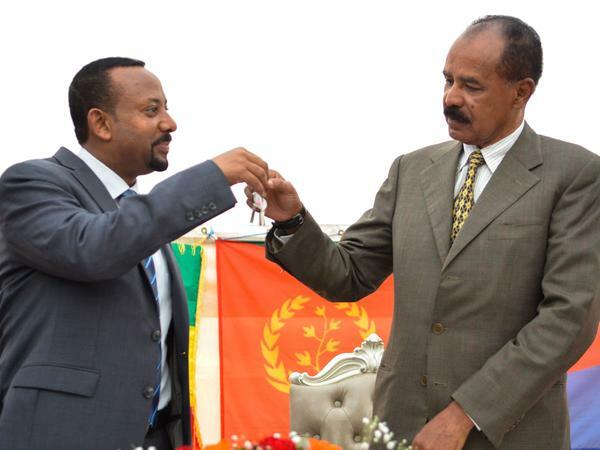 Ethiopian Prime Minister Abiy Ahmed (left) and Eritrean President Isaias Afwerki (right) celebrated the reopening of the Embassy of Eritrea in Addis Ababa in July. "We heralded the new year by demolishing the trenches along our border," Abiy told media, according to Reuters. "As of today, Ethiopia's defense forces (along the border with Eritrea) will be gathered to camps and ease tension that was often extreme. The same will be done from the Eritrean side." Video and photos emerged of people embracing, dancing and weeping as flags of both nations flapped in the breeze. Some analysts have compared the events to fall of the Berlin Wall, NPR's Eyder Peralta reported. Families that were separated on either side of the border are finally able to reconnect. The border reopening will also bring back trade. Bure gives landlocked Ethiopia access to Red Sea ports. The other reopened crossing, in the frontier town of Zalambessa, is northwest of Bure and on a major trade route between the countries. The road was guarded by the military, and as Al Arabiya described it, "the once-bustling trade hub where cactuses sprout from conflict-damaged buildings is eerily quiet." The path toward peace began shortly after Abiy took office. In July, he stepped off a plane in Asmara, the capital of Eritrea, and hugged its president. Together they rewrote the future of their countries by signing a peace deal. The reopening of the border is the latest sign that icy relations have thawed. The summer saw telephone connections restored, the first commercial flight in 20 years from Ethiopia to Eritrea and embassies reopening in the capitals. The Chief of Staff for the Ethiopian Prime Minister, Fitsum Arega, called the border reopening "the full normalization" of relations. He said that with roads linking the countries open, "our recent tragic history is coming to an end." Eritrea was once a province of Ethiopia. It gained independence in 1993. Border clashes began in 1998, and tens of thousands of people died in the two-year war. Residents near another stretch of the border said soldiers from both countries were clearing landmines before another "potential opening" on Monday, according to Al Jazeera. "This is the happiest day of my life," Ruta Haddis, an Eritrean who lives near Zalambessa, told media, according to Reuters. "I never thought this would take place in my lifetime." Some people remain skeptical about whether peace will hold. As part of Ethiopia's sweeping reforms, Abiy also vowed to honor international rule by giving Badme, a disputed territory, back to Eritrea. His announcement angered some Ethiopian veterans as well as their descendants. Habtom Shiferaw, whose family members fought in the war, told Reuters, "They should not expect peace here if they force us to leave."